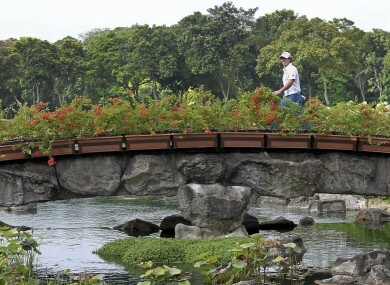 McIlroy in Singapore this week. DANISH VETERAN Thomas Bjorn outshone world number one Rory McIlroy today as he moved two shots clear after a marathon second round at the storm-disrupted Barclays Singapore Open. Bjorn, 41, hit a sparkling four-under-par 67 at par-71 Sentosa Golf Club to give himself a great chance of his first win of the year, especially after weather delays left the event at risk of being cut to 54 holes. The Ryder Cup vice-captain’s rounds of 66 and 67, for a 133 total, are two better than South Africa’s George Coetzee, who shot a brilliant eight-under-par 63, and England’s Chris Wood after his 65. Francesco Molinari, who starred in Bjorn’s victorious Ryder Cup team, hit 67 to lie three off the lead and one ahead of England’s Simon Dyson and three-time winner Adam Scott, who fired himself into contention with a 66. McIlroy, needing a top-three finish to clinch the European order of merit, as he seeks to win the money lists on both sides of the Atlantic, shot his second successive round of 70, leaving him seven shots back from the leader. Phil Mickelson chipped bravely between two palm trees for birdie on the 18th to avoid the cut by a stroke, but Major-winner Padraig Harrington, who claimed the PGA Grand Slam of Golf last month, was eliminated after rounds of 74 and 73. The action completed a stop-start round that started on Friday morning and was halted after just a few hours as lightning storms hovered over the course. It finally wrapped up mid-afternoon on Saturday — 28 hours later. “The course is not easy but especially having to go out and come back in. It’s a been a bit of a frustrating few days,” McIlroy said. Thailand’s joint overnight leader Chapchai Nirat dropped to tied seventh with a 73, and 2010 British Open winner Louis Oosthuizen — who still has a slim chance of beating McIlroy to the European money title — shared 15th. Meanwhile larger-than-life American John Daly, winner of two Major titles in the 1990s, withdrew overnight citing fatigue. After long storm delays on Thursday and Friday, officials said the $6 million event may be reduced to three rounds if there are any more interruptions. The Boot Room: What do your pair say about you? Email “Bjorn outshines McIlroy in stormy Singapore”. Feedback on “Bjorn outshines McIlroy in stormy Singapore”.